From May 8-12, 2017, the Terra-i team, together with staff from the DGOTA of Peru’s Ministry of Environment, carried out the first field validation of vegetative land cover changes detected during Terra-i monitoring for 2016 and 2017, using the technology UAV. 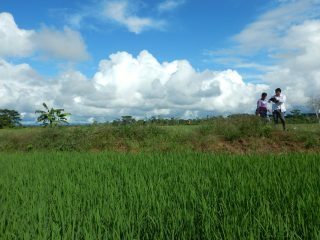 This work was carried out under the framework of the project “Sustainable Amazonian Landscapes”. The team carried out over-flights with a Phantom 3 advanced rotor drone and a fixed-wing Ebee drone in seven townships of Yurimaguas. The objective of this work was to recognize the dynamics of land cover and land use changes in the region while at the same time to validate the accuracy of the detections of forest loss being monitored by Terra-i in Yurimaguas. The monitoring of land cover vegetation and land use changes proves to be a theme of great interest within the field of conservation. This monitoring enables us to study the current states of highly important land covers, such as the tropical rainforest of the Amazon. 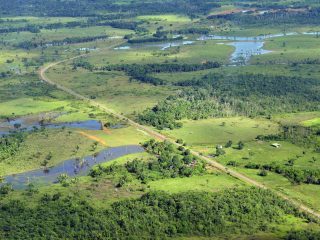 The Amazonian forest has seen drastic human intervention in the last decade due to areas being cleared for continuous expansion crops, such as oil palm or rice. Currently, land cover monitoring is being carried out through satellite imagery analysis, as is the case with the Terra-i system, which uses low resolution spatial images (250 meters) of high temporality (every 16 days) in order to monitor land cover changes at the pantropical level. In order to ensure higher reliability from the satellite image analysis, it is important to evaluate the accuracy of the detections corresponding to land cover changes by carrying out detailed in-field validation and verification processes. The Terra-i team has performed a series of in-field validations where the accuracy of the pixels of the land cover loss detected by the system was evaluated. This process consists of the random selection of a sampling of pixels, a subsequent field visit to each sub-sample corresponding to a point from the MODIS pixel (there are 9 sub-samples in an area of approximately 6 ha), followed by the taking of geo-referenced photos and implementation of surveys in order to determine the cause of the change. These field corrections end up being time-consuming and costly, which is why UAV drones are now being used as an alternative to field validation. With a drone you can capture high quality images which are then used to validate the changes recorded by satellite, as well as to determine the type of land cover present and the area of the detected change. The synergy between satellite image analysis, drone use and field data, together with the monitoring of regional land cover and land use change dynamics, makes it possible to evaluate the detection accuracy of a model like Terra-i and to calculate the exact area of the change in terms of pixels. Figure 1. Use of satellite images, drones and field data to monitor land cover and change dynamics in a territory. Applications: Easy to launch and transport for rapid monitoring of small land plots (<25Ha) (<25Ha). We carried out validations in the “Sustainable Amazonian Landscapes” project study site in the district of Yurimaguas, which possesses the greatest amount of land cover and land use changes within the province of Alto Amazonas (See Figure 2). This areas has accumulated 5,442 Terra-i alerts (approximately 34,012 ha) from 2004 to March of 2017, with an annual loss rate of 2,557 ha/year since 2016. We performed 12 overflights, of which 9 were carried out with the Ebee drone (Figure 3, green stars) and 3 with the quadcopter (Figure 3, blue stars). We selected the validation areas according to the spatial distributions of the Terra-i change detections for the dates 2016-2017 in the zone. Lastly, we validated 34 alerts from 2016 and 8 from the period of 2017, equivalent to 263 ha (see the flight areas in Figure 3 map). In table 1, characteristics of each flight, number of alerts analyzed, and the resolution of mosaics processed by each drone are specified. Finally, we analyze the mosaics using the detections obtained from satellite imagery, evaluate the precision of the Terra-i detections in order to calibrate the model, and analyze the principal drivers by pixel and by area of change. The district of Yurimaguas has seen a significant rise in the loss of land cover in 2016 at an increase of 150% since 2015. Terra-i detected a change of aproximately 3,320 ha (531 alerts) for the period of 2016 to March 2017. These changes are related to the rise in logging and burning of primary and/or secondary forests, which have been subjected to selective extraction of timber to allow for the installation of annual and permanent crops such as rice, papaya, and oil palm. The changes were encountered close to principal roadways which lead to Balsapuerto and Tarapoto, as well as along the Paranapura and Shanusi rivers. Figure 5. Flight number 3 carried out with Ebee drone close to San Francisco de Paranapura (a) Mosaic generated with drone image, with overlaid pixels for land cover changes detected by Terra-i for 2016 (red) and 2017 (pink); (b) Detailed panels of 3 Terra-i pixels from 2016 and 2017, digitization of the land cover present; (c) Photos of ‘drivers’ taken in-field during field validations from 2015 and 2017. The changes in land cover loss detected by Terra-i were analyzed with images captured by the drones; Figure 5 shows a flight with the Ebee drone of 140 hectares, carried out close to San Francisco Paranapura, which contained 3 Terra-i detections from 2016 (red pixels) and 2 from 2017 (pink pixels). Three Terra-i detections from 2016 (2) and 2017 (1) were analyzed (each pixel is 5.3 ha), where we identified that the principal causes of the land cover changes are the implentation of papaya (>6 ha) and palm oil crops. We also observed that there were 3 ha of floodplain forests with recently installed palm trees (Aguajal), as well as bare soils as a result of logging and burning. Likewise, we carried out flights in the areas of change detected by Terra-i close to the rivers, which are a result of the planting of rice crops. According to the Peruvian Ministry of Agriculture and Irrigation (MINAGRI), there was an increase of 8.2% in areas planted with rice reported in Loreto between August 2015 and June 2016, due to the farm-gate price of paddy rice increasing in this time period (Andina, 2016). Figure 6 shows a flight of 140 ha carried out with the drone Ebee, close to the Paranapura river in Santa Lucia, which contained 6 Terra-i change detections from January to October, 2016. We analized 3 detections from January, March and April, 2016, in which we identified rice cultivation areas greater than 16 ha, floodplain forests with palm trees recently felled, bare soils and small-scale in-farm palm crops. There is also evidence of the expansion of this crop (palm) within primary forests, which are under threat. Figure 6. Flight number 6 carried out with the Ebee drone close to Santa Lucia (a) Mosaic generated with drone images, with overlaid pixels for land cover changes detected by Terra-i for 2016 (red); (b) Detailed panel of 3 Terra-i pixels from January, March, and April 2016, digitization of land cover present; (c) Photos of ‘drivers’ taken in-field during field validations from 2015 and 2017. Economic development and human in-migration have generated an increase in the demand for land in Yurimaguas, leading to greater pressure on the primary forests for use as newly transformed areas for the implementation of subsistence and commercial agriculture. This dynamic of land cover changes tends to be more accelerated in the principal highways towards Balsapuerto and Tarapoto. Various groups of agricultural producers can be identified, taking into account their primary activity, among them are highland terrace farmers, riverside farmers, and palm cultivators. 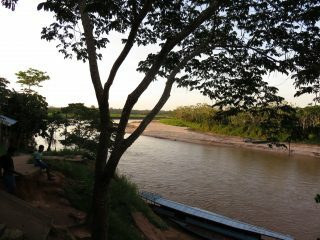 To access the fieldwork’s photo gallery, visit the flickr account of the project “Sustainable Amazonian Landscapes” here. We would like to thank all of those involved in the execution of the fieldwork. This work has been carried out as part of the project “Sustainable Amazonian Landscapes” which is financed by the International Climate Initiative (IKI). The project is led by CIAT and implemented together with the Potsdam Institute for Climate Impact (PIK), the Centro para la Investigación en Sistemas Sostenibles de Producción Agropecuaria (CIPAV), Instituto Amazónico de Investigaciones Científicas SINCHI, Universidad de la Amazonía, Instituto de Investigaciones de la Amazonía Peruana (IIAP), and the Universidad Nacional Agraria La Molina (VLIR-UNALM). Written originally in Spanish by: Paula Andrea Paz. Translation by: Natalie Orentlicher (CIAT).